Canadian pop heartthrob Corey Hart turned down some pretty lucrative offers at the height of his fame in the '80s. After Steven Spielberg himself sent the "Sunglasses At Night" singer a copy of the Back To The Future script and invited him to take a screen test for the role of Marty McFly, which Hart politely declined in the interest of focusing on his music. He also passed on the opportunity to record the song "Danger Zone" from the Top Gun soundtrack — a single Kenny Loggins would eventually make famous — because he was more interested in recording material that he'd written himself. 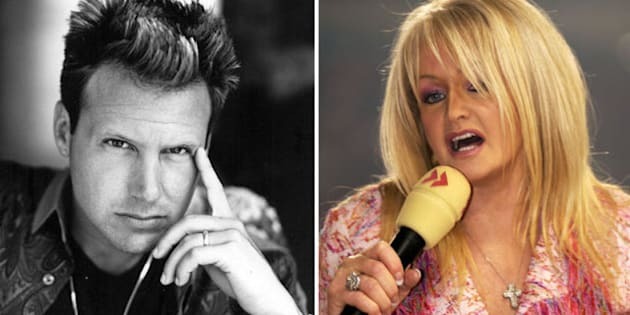 But the one artistic decision that the singer and songwriter genuinely regrets is turning down a duet with fellow '80s chart-topper Bonnie Tyler. That's right: Corey Hart was given the chance to combine the heart-wrenching powers of "Never Surrender" and "Total Eclipse Of The Heart," and he refused. "I'm a stupid guy," Hart confesses to Huffington Post Music Canada with a laugh. "What can I tell you?" In retrospect, he takes full responsibility for denying the world that sort of epic ballardy and wishes that he'd gone about things differently. "I like Bonnie Tyler," he says. "I really do. I made some really dumb decisions and I should have... I'd like to blame the managers and the record companies and everyone like that, but the truth is I have to blame myself because at the time it just didn't seem like it was the right thing to do." He wouldn't mind a second chance, though. "I'd do one with her now!" he enthuses. It could work. Harts's experiencing a career revival thanks to his gay anthem "The Truth Will Set You Free" and Tyler has reportedly been working on an album with some Nashville heavyweights. In the meantime, he's turned his four daughters on to Tyler's music, at least partially. Hart likes to make compilations for his kids in an effort to expose them to more artists, and a couple of her songs have made an appearance in these musical history lessons. "I want them to know more than what they hear on their own. I said, 'It's important. I wasn't around for Elvis. I wasn't around for The Beatles, but I've learned a lot of these songs and I want you guys to know songs like that.'" He admits that his daughters' bright eyes haven't been turned around by Tyler's biggest hit, but they're pretty keen on her other offerings. "They don't like 'Total Eclipse.' But they like 'It's A Heartache.'"